THOSE in the know at Richmond say you won't notice Dan Butler unless he wants you to. In that case, Butler clearly decided 2017 was his year to shine, because it's been impossible to miss him. There is his blinding speed, prominent place in the Tigers' mosquito fleet of forwards and that table tennis competition, which left housemate and teammate Jason Castagna with 'D.B' tattooed on his rear. And now his round 11 NAB AFL Rising Star nomination, after two goals, 13 disposals, six score involvements and four inside 50s in Saturday night's win over North Melbourne. Butler, 21, was drafted way back in 2014, but spent two years somewhat in the wilderness because of a knee injury in his debut season, then was left in the VFL in 2016. Three times he was a senior emergency last year – including the last two rounds – before a big pre-season and coach Damien Hardwick's increased focus on forward-half pressure created an opportunity. 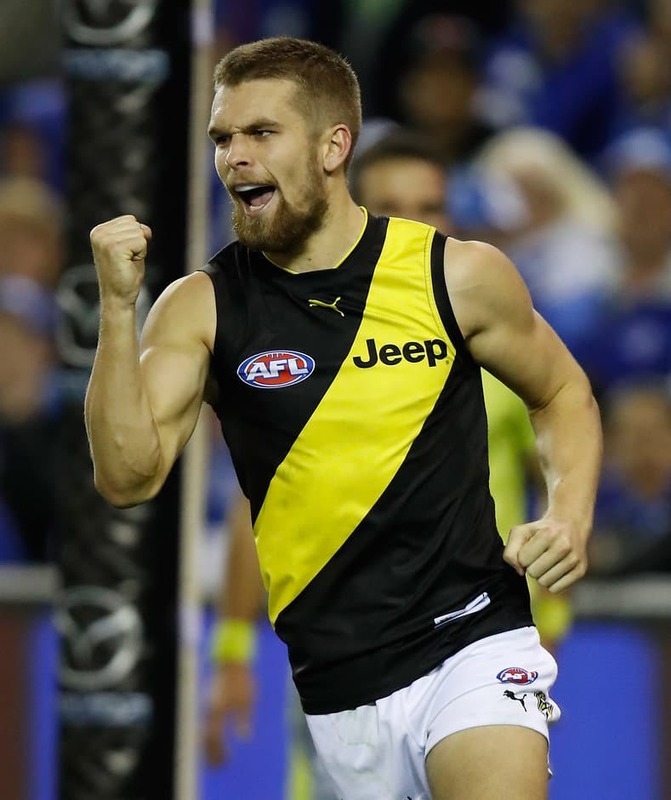 Butler made his AFL debut in round one and has missed only two games since because of a groin injury, forming a strong combination with Daniel Rioli, Castagna and, more recently, Shai Bolton. "It's been a long time coming … there were a few times where I was kind of in a dark place and questioned whether I was good enough to be here," Butler told AFL.com.au in March. "Form wasn't going my way, but I kept working hard and results came my way. "I've put in a fair bit of hard work the past year and it's paid off. It's a very exciting time for me and my family, and I can't wait. I'm pretty pumped for it." Butler has made a quick impression on Richmond's general manager of football, Neil Balme, since the latter returned to Punt Road in September last year. "He's a pretty quiet kid and naturally very modest, but he does have a strong belief in himself, which is clear with the way he's come on this year," Balme said. "He's also naturally very competitive, but not in an overt way – he just goes about his business. "Being recognised in this Rising Star capacity will be a really good thing for him, to have some confidence in himself. He won't admit it, but he will treasure it. "Some people get an opportunity really early. He's had to work very hard for his and he'll be quietly really chuffed about the fact he's been recognised." Balme is confident Butler has the makings of a midfielder in the future, or even a backman if the Tigers needed him there, such is the Lake Wendouree product's versatile skillset. But it is unlikely Hardwick will break up his small forward corps any time soon, given they have helped Richmond become the AFL's No.1 forward-half pressure side. Butler is the Tigers' first Rising Star nomination since Rioli in round 22 last year, but Balme predicted there could be more before season's end. "It's very hard to predict, but we do have a good bunch of kids who would be eligible," Balme said. "I won't put too many names in everyone else's heads, but there are a couple of them who play pretty close to this guy who play pretty good."